Scales are no doubt an integral part of most zoo operations. Scales help to alert zoo veterinarians of issues and potential diseases affecting the health of animals. The problem with many veterinary scales is that they may not offer the capacity to weigh large animals such as alpacas and llamas, which are staples at zoos around the country. With animals being the lifeblood of what brings people into zoos, it’s incredibly important that zoo veterinarians take every precaution to ensure their animals are healthy. At Arlyn Scales, we’re proud to have manufactured a line of large platform scales that are capable of weighing all sorts of zoo animals. Arlyn Scales is a leading scale manufacturer located in Long Island, New York. With over 30 years of experience in the industry, we’ve developed a line of scales suitable for all types of industries, including zoo operations. Unlike many of our competitors, at Arlyn Scales, we manufacture all of our scales right here in the US, in our own factory. Manufacturing our own scales in-house affords us several advantages over the competition. Many companies that sell industrial scales are simply distributors for other companies that manufacture scales overseas. This means that should you ever have an issue with your scale, it may be difficult to find the answers you need. Contrarily, when working with Arlyn Scales, if you have any issues, you can simply pick up the phone and contact our team of experts via our toll free number. Along with our top-notch customer support, we’re also able to offer a slew of high quality scale features that aren’t offered by competitors, even at much higher price points. At Arlyn Scales, we understand that the needs of each of our customers are vastly different. Many of our customers looking for scales to weigh zoo animals are looking for a variety of platform sizes and scale features. We understand this predicament and therefore offer a variety of optional scale features that can be added based on your needs. In addition to these features, we can also design a fully custom scale solution if necessary. Load cells are likely the most important component of any veterinary scale. Many of our competitors manufacture their load cells out of aluminum or steel to save money. At Arlyn Scales, we manufacture most of our load cells out of stainless steel to ensure they’re able to withstand the daily rigors of weighing large animals. We also recess the load scales into the platforms of our scales to protect them from certain materials that could cause damage. In our animal scales, we use four separate stainless steel load cells to offer more accurate readings, even if the animals aren’t able to stand in the direct center of the scale. These separate load cells also protect the scale from shock loading and overloading, which are both common when weighing extremely large zoo animals. Another reason why we recess our load cells into our scales is that it allows us to create a much lower profile platform. This makes it much easier for animal handlers and veterinarians to load and unload animals onto our large animal scales. Because we not only produce our scales, but all of our scale components in our own US-based factory, we’re able to control every facet of the manufacturing process. One of the areas most vulnerable within a scale is the summation board. These boards are what are used to help calibrate load cells. The process of calibration is entirely manual and can be quite time-consuming to ensure that load cells are calibrated correctly. At Arlyn Scales, we don’t need to use summation boards in our scales. When manufacturing our load cells, we sort load cells in groups of four based on precision measuring of the output signal of each load cell. By sorting our load cells by output signal we’ve been able to eliminate the need for summation boards in our scales. There’s no denying that zoo animals can be incredibly messy, especially when they feel uncomfortable, which can be common when being weighed. Because of this, Arlyn Scales created water-resistant scale platforms that can stand up to the daily abuse common when weighing large zoo animals. Whether you’re weighing small or large zoo animals, Arlyn Scales has a variety of scale options to meet your needs. We offer capacities ranging from 10 pounds all the way up to 5000 pounds, allowing you to weigh all types of zoo animals. Should these capacities be insufficient, we can also discuss other custom platform sizes and capacities. When weighing zoo animals it’s always important to have quick access to weight data for any number of reasons. In the past, weight readings would have to be recorded manually, allowing for significant human error. 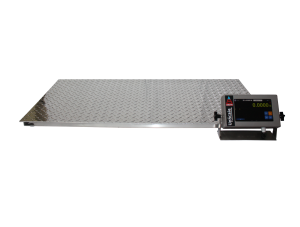 With our latest animal scales you no longer need to worry about the manual recording of weight readings. Below are just a few of the connectivity methods supported by our line of large animal scales. USB – If your scale is easily accessible from your PC you can simply use a USB cable to offer instant connectivity. Using our USB Remote Software, you’ll be able to control your scale and access weight data directly from your computer. Export data to Excel or Access, all from this easy-to-use interface. If you don’t have access to these programs, we also offer a free utility that allows you to access the weight data using other Windows based applications. Ethernet – If you have a local network within your zoo, you can simply connect an animal platform scale directly to your network. With this connection, you can easily control and access weight data from your scale. You can either connect with a wired connection or wirelessly. By connecting your scale to your corporate network, you can even access scale data from anywhere, provided that you have an active Internet connection. Datalogging – Some zoos may not have a computer located near their animal scale. In these instances, you can use our datalogging functionality, allowing you to connect a USB drive directly to your scale to download weight data. Once you’re near a computer, you can access the weight data for further analysis. Interested in Learning More About Our Animal Scales? If you have any other questions about our line of animal scales suitable for zoos, feel free to contact us at anytime, toll free at 1-800-645-4301. We look forward to working with you very soon.